Aim and Objective: The aim of the current study is to evaluate the knowledge of dental practitioners in Saudi Arabia about managing physically challenged patients. Materials and Methods: A cross-sectional digitalized survey was conducted among dental practitioners including both male and female. The questionnaire consisted of 20 items which included years of dental practice, previous experience treating a physically challenged patient, and any difficulties handling such cases. The survey was distributed through E-mail, social media official accounts. Chi-square test was used to investigate associations between factors using SPSS Pc+ version 22.0 statistical software package (Chicago, IL. WA). Results: A total of 2030 dental practitioners participated in this study. The majority (91.0%) reported that their university was not good enough in preparing them to treat a physically challenged patient and they need to have more knowledge to treat them. Hearing impairment reported as the hardest to manage. Two-third (66.6%) reported that their clinic does not have the facilities to help in managing such patients. Statistically, a significant association was found between gender and most of the items of perception (P < 0.05). Conclusions: Treating physically challenged patients considered as a challenge for most of the dental practitioners in Saudi Arabia. Dental school should provide more courses and training programs about how to manage physically challenged patients. The use of communicating technology tools is highly recommended to manage those patients. Nowadays, the education of dental practitioners is improved, and they have awareness of many disabilities and the ways of handling a physically challenged patient. Physically challenged is a limitation of physical function which is not involving any mental illnesses. According to the WHO (2018) over a billion people, about 15% of the world's population have some form of disability. People with disabilities have less access to health-care services and therefore experience unmet health-care needs. Patients prioritize their physical health over their oral health. Hence, it is the responsibility of the dental practitioners to be well educated, have adequate knowledge about how to handle these issues, treat them ethically, and provide them with the treatment they seek. Some of the dental practitioners face difficulty to treat a physically challenged patient because of the communication, more office hours, limitation in dental services, and skills. However, some dentists refuse to treat physically challenged patients because they do not have the confidence and the knowledge. It is unethical to refuse to treat them, and that might affect them emotionally and affect their oral health. Communication is an essential component of our lives. It is the relationship between the dentist and the patient, so without a good communication the dentist will face misunderstanding, lack of response and the patient would not have the trust and the confidence to come again. Meanwhile, by establishing a good communication, we will decrease the anxiety of the patient and gain his trust and be able to motivate them to take a good care of their oral health. Dealing with a physically challenged patient is very challenging and studies have shown that undergraduate dental students' needs more improvement in the knowledge by making educational courses and programs. The aim of this study is to evaluate the level of knowledge of dental practitioners in Saudi Arabia and how they can handle a physically challenged patient. A cross-sectional study was conducted among dental practitioners in Saudi Arabia to evaluate the knowledge toward managing physically challenged patients. The sample size of this study was determined using the OpenEpi website for sample size calculation (openepi.com) to be representative. A 20-item questionnaire has been constructed and sent through E-mails and social media using survey monkey. The ethical approval for the study was obtained (FUGRP/2018/79). The questionnaire included demographic information such as: gender, level of education, region, and a number of years practicing dentistry. Confidentiality and anonymity were assured. The questionnaire was adapted and modified from a similar survey conducted in Nebraska general dentists. A pilot study was the first step before conducting the whole study. Thirty (15 males and 15 females) practitioners have been involved by filling the questioner twice at the beginning and the end of the same week for 2 weeks. Their answers have been compared and the questioner modified accordingly for validation purposes. It consisted of 16 questions on dental practitioners' perception of handling a physically challenged patient. The data collected was entered into Statistical analysis was performed using SPSS version 13.0 (IBM, Armonk, New York, USA) for Windows. Descriptive statistics were performed to present the overview of the findings. Pearson Chi-square test was used to find the association between gender, level of education, region, and a number of years practicing dentistry with the dental practitioners' perception. A P ≤ 0.05 was considered statistically significant. [Table 1] shows the demographic characteristics of the participants. 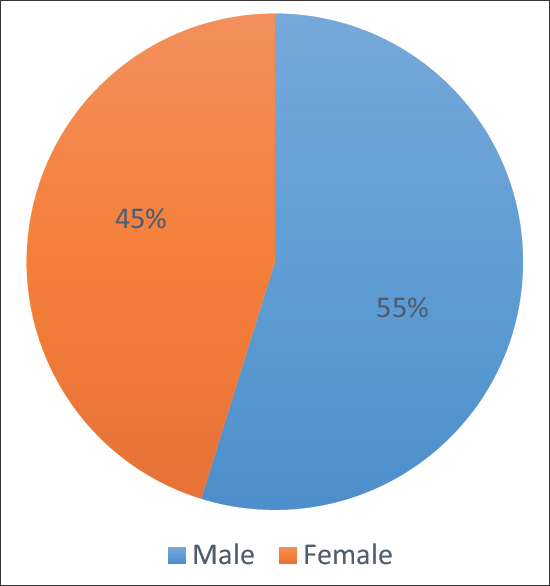 Of the total 2030 respondents 54.8% (n = 1112) were female and 45.2% (n = 916) were male [Figure 1]. 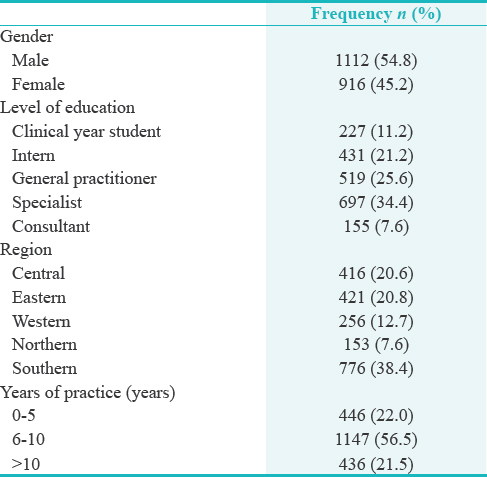 Just over one-third of the respondents were specialist (34.4%, n = 697), followed by general practitioner (25.6%, n = 519), intern (21.2%, n = 431), clinical year student (11.2%, n = 227), and consultant (7.6%, n = 155) [Figure 2]. 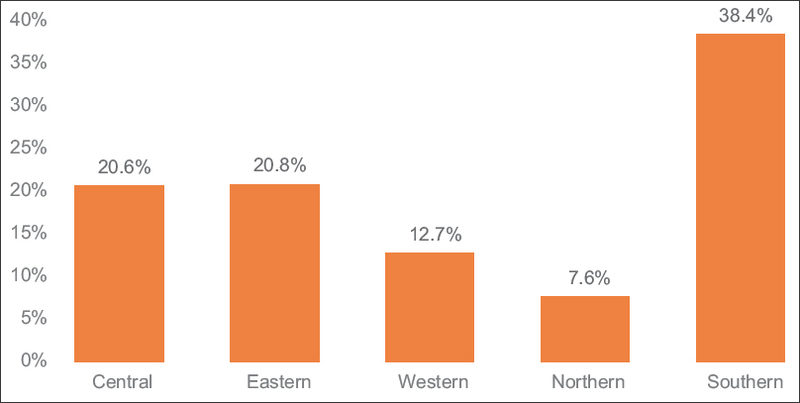 Over one-third of the respondents were from southern region (38.4%, n = 776), followed by eastern (20.8%, n = 421), central (20.6%, n = 416), western (12.7%, n = 256), and northern (7.6%, n = 153) [Figure 3]. The majority of the respondents had 6–10 years of experience (56.5%, n = 1147), followed by 0–5 years (22%, n = 446) and >10 years (21.5%, n = 436) [Figure 4]. [Table 2] shows the dental practitioners perception toward management of a physically challenged patient. Around 47.2% (n = 909) reported that they know about physically challenged patients and how to manage them. Just over half (53.6%, n = 1087) have never treated a physically challenged patient. Under one-third (31.1%, n = 631) think that a physically challenged patient is treated fairly. The majority (64%, n = 1298) do not mind treating a physically challenged patient but first, they need to have more knowledge to treat them. The majority (68.9%, n = 1398) have heard about a dental clinic for treating a physically challenged patient. Around 41.1% (n = 834) reported that they have not treated a physically challenged patient. Approximately half responded that patients with hearing impairment are harder to manage (52.1%, n = 1057) and that a physically challenged patient does not need a special skill to be treated (49.5%, n = 1005). Around 48.2% (n = 977) think a physically challenged patient need special equipment to be treated. Approximately two-thirds (66.6%, n = 1352) reported that their clinic does not have the facilities to help you manage a physically challenged patient. The majority (91%, n = 1846) reported that the education at their university was not good enough preparing you to treat a physically challenged patient, but they are willing to know more about them. Around two-thirds (67%, n = 1361) reported that due to the lack of dentist knowledge in handling them treating a physically challenged patient are challenging. The majority (57.2%, n = 1161) think that having a patient with the company (family member or a friend) will help to communicate/handling them easily. Around one-third (33.6%, n = 683) reported that they prefer to book an appointment for your physically challenged patient in the morning. The majority (57.1%, n = 1158) reported that they may need more specific courses/programs about handling a physically challenged patient. 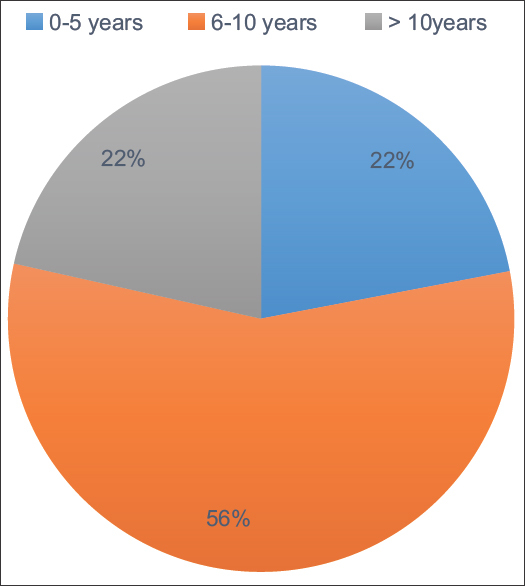 Participants in approximately equal proportion reported that use of a special computer software (50.4%, n = 1015) and usage of a special phone application (49.6%, n = 999) may help in a better communication with a physically challenged patient. Pearson Chi-square test showed a statistically significant association between gender and all the items of perception (P < 0.05) except items 5 and 11 (P > 0.05). There was a statistically significant association between the level of education and all the items of perception (P < 0.05). Moreover, the statistically significant association was found between the region and all the items of perception (P < 0.05). Statistically, a significant association was also found between years of practice and all the items of perception (P < 0.05). The present study reports the level of knowledge of dental practitioners in Saudi Arabia and how they can handle a physically challenged patient. There is a scarcity of studies related to the investigation of the dental practitioners' perception toward the management of physically challenged patients. According to this study, only 46.4% of dental practitioners treated physically challenged patients. However, this finding was not in line with previous studies among dental practitioners in India, Ireland, and Canada which reported 64.4%, 66%, and 88.9%, respectively.,, Moreover, a study by the general dentist in the United States reported that 97% treated a physically challenged patient. Dentists play an imperative role in the stipulation of dental care to the patients with special needs. This requires exceptional skills, willingness, patience, knowledge, compassion, and motivation. However, reduced dentist skills and comprehension in managing patients with special needs were one of the main recurrent barriers. In the present study, it was noted that 67% of the respondents reported that due to the lack of knowledge; handling physically challenged patient is a foremost challenge. A study done in Australia revealed that dentists who were not providing treatment to disabled patients delineated lack of experience and intricacy in managing behavior as main reasons. In another study, more than two-thirds of participants did not believe that the dental team was contented or educated when dealing with such patients. This is in contrary to the findings of previous studies, which reported insufficient financial reimbursement and communication difficulties as a major reason. Above finding was in line with Gagandeep Chadha et al. study where the main obstacle in treating patients with special health-care needs was communication difficulties, while 1.5% of the respondents found concern with low payments as a barrier. In the current survey, about 91%, of the respondents reported that the education at their university was not good enough to treat a physically challenged patient. In the study done in Saudi Arabia, more than two-thirds of the dentists did not agree to the statements that their undergraduate education and the teaching atmosphere set them well for managing patients with special health-care needs. However, in converse, a majority of the general practitioners in Australia thought that their education in the university was adequately preparing them to manage physically challenged patients. In Leicestershire, Baird et al. investigated the accessibility of amenities for physically challenged patients at dental practices and revealed that the services for this population were deprived and lacking. In the current study, around 48.2% of the respondents thought that physically challenged patient need special equipment to be treated. Approximately two-thirds (66.6%) reported that their clinic does not have the facilities to manage a physically challenged patient. This finding is in line with the study by Derwi D et al. who found that the majority of their respondents felt unequipped to manage patients with special health-care needs. Above finding was also in agreement with the results of the study done by Derbi et al., which found that the facilities were lacking. A literature exploration exposed that dentists conventionally have been reported as being unwilling to provide dental services to patients with disabilities and also that considerably insufficient level of comprehensive dental services are provided to such patients. In the present survey, the majority (64%) had no problem in treating a physically challenged patient. This was seen in a study by Alamoudi et al., where more than one-half of the dentists affirmed that they like treating patients with special health-care needs. These results generally exhibited positive attitude by dentist toward treating the patients with disabilities. The learning of apt interpersonal communication skills has been reported to be a decisive part of health care professional's education. The majority (57.2%) of the participants thought that having patients with their family member or a friend will help to communicate or to handle them easily. Participants also reported that the use of a special computer software (50.4%) and usage of a special phone application (49.6%) may help in a better communication with a physically challenged patient. The present study found a statistically significant association between the level of education and number of years of dental practice with the perception of dental practitioners' treatment of the physically challenged patient. However, this finding was not in agreement with previous studies which found no statistically significant relationships among these parameters., A study by Alamoudi et al. concluded that years of experience and specialty had no reflection on the perception of the quality of education outcomes. In a survey conducted in Nigeria, exposed that experience in this meadow is in fact gained with increasing years of practice. In addition, it has been acknowledged that dentists who had undergone training in special need dentistry throughout their undergraduate level treated more patients with special needs and had enhanced attitudes toward giving care for this populace, compared to dentists who were not exposed to such training. The majority of the dental practitioners (57.1%) reported that they may need more specific courses/programs about handling a physically challenged patient to overcome the barriers faced in treating these patients. This positive finding was also seen in the study by Alamoudi et al., where dentists articulated their consensus about the need for more education and their willingness to attain more education and training in the field of special health-care needs. Similarly, a study by Gagandeep Chadha et al. revealed that conducting Continuing Dental Education (CDE) and hands-on training in the management of patients with special health-care needs will assist to trounce the barriers faced by dentists in treating such patients. This was similar to the findings reported in previous studies.,,, The present study showed a significant association between gender as well as region and all the items of perception. In a study by Oredugba and Sanu, gender, and place of practice did not influence any of the parameters examined in their study. The limitation of this survey was that the information collected in this study was subject to response bias, also the disparity in the level of education and years of experience of the respondents. In addition, this study incorporated participants who had an institution-based dental practice, which might have ensued in greater than definite reporting for amenities in dental practices to accommodate patients with disabilities. In spite of the limitations, this study was successful in identifying the barriers and requirements to enhance the practitioners' capability to care for disabled patients. The additional research can be undertaken to examine the alteration in perceptions, behaviors, and attitudes of dentists after obtaining education and training for treating disabled patients. Within the limitations of this study, it can be concluded that treating physically challenged patients considered as a challenge for most of the dental practitioners in Saudi Arabia. Undergraduate programs in dental school should provide specific courses and training programs about management of physically challenged patients. The use of communicating technology tools is highly recommended to manage those patients. We are conducting a survey about Dental practitioners' perception toward management of physically challenged patient among Saudi Arabia and we would like you to be a part of our research by answering the following questions and will be great full for your help. How do you evaluate your knowledge about physical challenged patient? Have you ever treated a physically challenged patient? Do you mind treating a physically challenged patient? Who do you think is harder to manage? Do you think a physically challenged patient needs a special skill to be treated? Does your clinic have the facilities to help you managing a physically challenged patient? Do you think a physically challenged patient need special equipment to be treated? Did you face any difficulties while treating a physically challenged patient? Have you ever heard about a dental clinic for treating a physically challenged patient? Do you think your education in the university was good enough to treat a physically challenged patient? Do you think a physically challenged patient is treated fairly? Why do you think a physically challenged patient are challenging? Do you prefer your physically challenged patient comes to your clinic with a company? Do you think having the patient with company will help you communicating/handling them easily? When do you prefer to book appointment for your physically challenged patient? Do you think you need more courses/programs about handling a physically challenged patient? Do you think one of the following will help you in communicating with a physically challenged patient? Jette AM. Toward a common language for function, disability, and health. Phys Ther 2006;86:726-34. World Heslth Organization. Disability and Health. World Heslth Organization; 2018. Available from: http://www.who.int/. [Last accessed on 2018 Nov 22]. Suhani RD, Suhani MF, Badea ME. Dental anxiety and fear among a young population with hearing impairment. Clujul Med 2016;89:143-9. Mohebbi SZ, Chinipardaz Z, Batebi A. Effectiveness of training senior dental students on oral health care for disabled patients. Eur J Dent Educ 2014;18:214-21. Kuhlmann T. International classification of functioning, disability and health. Suchttherapie 2011;12:7. Pizzo L. Vocabulary instruction for the development of American sign language in young deaf children: An investigation into teacher knowledge and practice. Sign Lang Stud 2018;18:238-65. Van Norman GA. Ethical issues in informed consent. Perioper Nurs Clin 2008;3:213-21. Shah AH, Fateel A, Al-Nakhli O. Dentists and dental students opinion regarding dental treatment of patients with special needs. J Pak Dent Assoc 2011;20:98-104. Salama FS, Kebriaei A, Durham T. Oral care for special needs patients: A survey of nebraska general dentists. Pediatr Dent 2011;33:409-14. Smith G, Rooney Y, Nunn J. Provision of dental care for special care patients: The view of Irish dentists in the republic of Ireland. J Ir Dent Assoc 2010;56:80-4. Loeppky WP, Sigal MJ. Patients with special health care needs in general and pediatric dental practices in Ontario. J Can Dent Assoc 2006;72:915. Gagandeep Chadha GS, Shenoy RP, Jodalli P, Siddique S, Dsouza N. Attitude of dentists towards providing oral health care to patients with special health care needs (PSHCN) in Mangalore, India. Int J Oral Care Res 2015;3:1-7. Derbi H, Borromeo G. The perception of special needs dentistry amongst general dentists within Western Australia, Australia. J Gerontol Geriatr Res 2016;5:2. Alamoudi N, Almushayt A, El Derwi D, Mirdad L, El-Ashiry E. Dentists' perception of the care of patients with special health care needs in Jeddah, Saudi Arabia. J Oral Hyg Health 2017;5:226. Milnes AR, Tate R, Perillo E. A survey of dentists and the services they provide to disabled people in the province of Manitoba. J Can Dent Assoc 1995;61:149-52, 155-8. Baird WO, McGrother C, Abrams KR, Dugmore C, Jackson RJ. Access to dental services for people with a physical disability: A survey of general dental practitioners in Leicestershire, UK. Community Dent Health 2008;25:248-52. Oredugba FA, Sanu OO. Knowledge and behavior of Nigerian dentists concerning the treatment of children with special needs. BMC Oral Health 2006;6:9. Milano M, Seybold SV. Dental care for special needs patients: A survey of texas pediatric dentists. ASDC J Dent Child 2002;69:212-5,126.